San Francisco! The Bad Asians are coming for you. 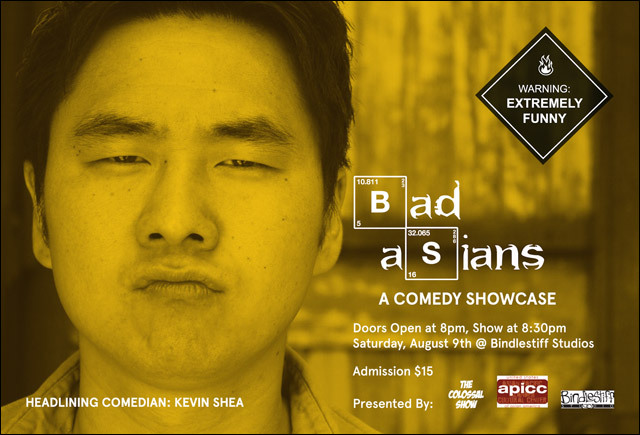 On Saturday, August 9, six API comedians will take the stage for Bad Asians: A Comedy Showcase, presented by API Cultural Center, Bindlestiff Studio and The Colossal Show. Headlining that night is Kevin Shea, seen on Comedy Central, HBO and Jimmy Kimmel Live. BAD ASIANS - A comedy showcase comes to San Francisco featuring six of the baddest Asian Pacific Islander American stand up comics. With performances by Kevin Shea, Francesca Fiorentini, Imran G, Samson Koletkar, Dash Kwiatkowski, and David Nguyen. APICC - A San Francisco arts nonprofit founded in 1996 whose mission is to support and produce multidisciplinary art reflective of the unique experiences of Asian Pacific Islanders living in the United States. THE COLOSSAL SHOW - The Bay Area's newest variety show and incubator of eclectic comedians featuring a diverse range of sharp and scintillating performers who embrace their idiosyncrasies and explore their creative frontiers. Tickets are $15, but enter in "knockknock" when you order online and get $5 off. For further information about the event, head over to the API Cultural Center's website.